Ever since the advent of the computer, financial services companies have been faced with increasingly significant data quality challenges. As the decades passed and computers became further ensconced in the everyday operations of financial services companies, those data quality challenges became even more pronounced and their effects more wide-ranging. Now, good data quality is absolutely essential to help organizations minimize risk while better informing business decisions. Unfortunately for many organizations, data quality tools that were purchased for IT to fix data issues have not keep pace with the ascendance of data governance programs that require business and IT to co-manage the quality of data as a business asset data. Financial services companies accounted for many early adopters of data quality tools back in the 1990’s and 2000’s However, those first generation tools were very IT-oriented: they were designed to be used by IT personnel to fix data issues during development projects. Those tools evolved over time, enabling businesses to profile data errors, define their own data quality rules, and effectively monitor and manage exceptions. 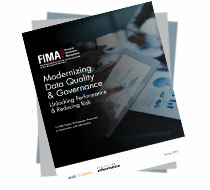 Gradually, the emergence of data governance programs shifted responsibility for managing data quality from the IT department to business leaders. In this context, business users became responsible for the definition of data quality rules, while IT focused more on the execution of those rules across the enterprise architecture. Although this new model asked business users to become much more involved in managing data quality, existing IT-oriented data quality tools were not designed for self service data quality management by business users.. Given the ongoing regulatory and revenue pressures across all sectors of financial services, managing data quality required business users to actively participate in this process. BCBS239 for example calls out specific principles that require well defined processes and responsibilities related to managing data quality by the business. Hence the need arose for solutions that allow data owners, stewards, analysts, and IT developers to manage the quality of data more effectively with each other. Many financial services companies are still in the process of implementing data quality processes that are rigorous and open enough to support the information needs of today.